Aluminum bellwether's better than expected demand forecast and benign economic news from top commodity consumer China sent mining stocks and metal prices soaring Tuesday. New York-based Alcoa (NYSE: AA) yesterday surprised the market when it reported better than expected profits on the back of solid end market demand growth. The leader – of what is a very beaten down industry – also expects global demand for the metal to rise 7% in 2013 thanks to increased orders from vehicle and aircraft manufacturers, another sign of a healthier global economy. Also buoying the mining and metals sector was news from China that inflation in the world's second largest economy came in lower than expected. China has been the main driving force of the so-called commodity supercycle of the last decade and the benign numbers make it easier for monetary authorities there to further stimulate its investment-driven economy. China dominates the global trade in just about every commodity including iron ore (representing 60% of world trade), copper (42%), coal (47%), nickel (36%), lead (44%) and zinc (41%). The country is expected to overtake India as the largest importer of potash in the near future and last year became the world's number one importer of gold. China boasts the world's largest car industry so its imports of platinum and palladium used to reduce vehicle emissions is crucial to the PGMs market as well. The good news sent metals prices soaring across the board on Tuesday. Copper jumped 2% to $7,599 a tonne or $3.45 a pound in New York futures dealings. Zinc advanced 1.7% to $1,923 a tonne or $0.87 a pound in London, while lead, tin and nickel also gained. Precious metals joined the rally with gold for June delivery adding over 1% or $16 to $1,590 an ounce on the Comex division of the New York Mercantile Exchange, its best level in a week. Always volatile silver was the star performer with May contracts adding over 3% to $28 an ounce, coming close to a 2-week high. July platinum futures gained 1% to $1,555 an ounce, while palladium for June delivery managed a slight improvement to $734 an ounce. Iron ore continued to defy predictions of a sharp correction in the price with benchmark 62% fines at the Chinese port of Tianjin continuing to strengthen adding another $1.50 to $139.10, an almost 4-week high. The stronger metals prices fed through to mining stocks with the majors making strong gains without exception. World number one miner BHP Billiton (LON:BHP) jumped 4.5%, Brazil's Vale (NYSE:VALE) added 4.4%, while Rio Tinto (LON:RIO) climbed a whopping 5.6%. Of the top diversified miners XStrata's ADRs listed in New York traded up 5.8% and merger partner Glencore International (LON:GLEN) bounced 4.6%, Anglo American (LON:AAL) shares moved 3.6% for the better, while Canada's Teck Resources (TSX:TCK) was a major gainer adding more than 6%. Copper giant Freeport-McMoRan (NYSE:FCX) added 4.6%, Southern Copper Corp (NYSE:SCCO) managed a more modest gain of 2.6% while fellow South American copper producer Antofagasta (LON:ANTO) increased 3.9%. US-based copper-gold miner Newmont Mining Corp's shares traded up 3.3%, global number one Barrick Gold Corp added 2.4%, while fellow Canadian gold counters Goldcorp (TSX:G) and Kinross Gold (TSX:K) both added more than 3%. AngloGold Ashanti (NYSE:AU) was the best performing gold miner with a 4.8% jump. Major iron ore miners also fared well with South Africa's Kumba Iron Ore (NYSE:KIROY) up 3% and both Fortescue Metals Group (ASX:FMG) of Australia and US-based Cliffs Natural Resources climbing more than 7.5%. 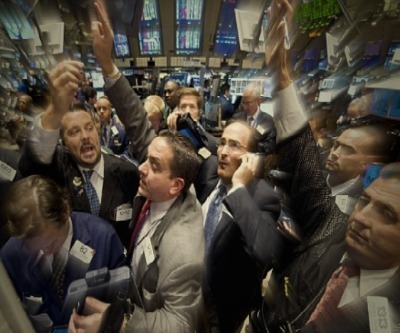 Image of Wall Street traders by thetaxhaven on flickr.